Language: French and Marquesan, a Polynesian dialect. Landscape: Mountainous, with rocky slopes covered in greenery. Tall spies of sheer rock create a distinctive profile. Note: You can also read the newsletter (now illustrated) that we emailed from Ua Pou. Being more immediate, it has a different flavor than the impressions listed below. Jon also put together some information for cruisers heading to the Marquesas. (Jon) Ua Pou (pronounced Wa Poo) was a delightful welcome to the Marquesas. The scenery was lush and spectacular, the village was pretty and well kept, and the people were friendly. Even more importantly (for the kids) of the 7 boats in the anchorage, 5 had kids! The cruising community sure has changed in 15 years. When Chris was a baby on Oriental Lady, cruising with kids was extremely novel. I think we knew of 2 other boats with kids back then. 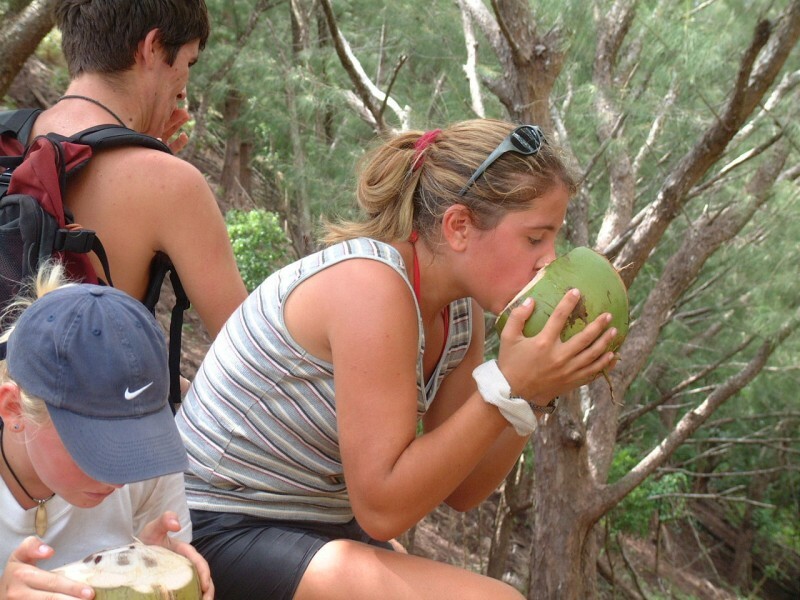 I suppose what struck me most about Ua Pou was the casual and friendly attitudes of the local people. They didn't usually come up to us and engage us in conversation (so no beggars, like in the Caribbean), but they were accepting and welcoming. They included us in their music festival (and the practice sessions leading up to it). They were happy to have us share their bocce ball courts on lazy afternoons. And perhaps most surprisingly, while there were no fruits to buy anywhere (why charge for something everyone has) they were happy to give us whatever fruits we wanted, even when we offered to pay for them. 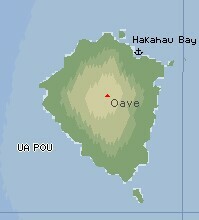 (Chris) Ua Pou was a really lovely island, and not only because it was the first land I'd been on in 25 days (not counting our brief stop at Ua Huka.) The island itself was tall and majestic, with steep slopes covered in forests and thin spires of rock reaching up well above the trees before coming to sharp points against the sky. The main town was small but neat, with a good dock providing easy access. The houses had large yards, and each was well kept. Fruit trees grew everywhere, and fresh mangoes or grapefruits could be acquired at little to no cost. There were several other boats in the anchorage, and a few had kids on board. We went to a local restaurant with the other boats for a sort of arrival party, and also went on guided tours of both the town and part of the island with several other yachts. We also saw our first Marquesan dancing here, during a local celebration. (Amanda) Ua Pou is so beautiful. Tall and green, with a small village towered over by highly forested spires... The water was murky and cold, warm compared to the Galapagos, but unless we hooked something with one of our two anchors underwater, I didn't care. We did scrub off the algae and goose-neck barnacles from our waterlines, though. I'm just glad that didn't require looking down into the water. One really interesting thing at Ua Pou is the museum. It's really small, with free admission, and they change the exhibit every couple of months. We were lucky enough to be there during the tattoo exhibit, and the museum manager dude - who spoke great English - gave us a wonderful presentation about the tattoos, then took us on a guided tour of the town - for free! Tattoos in French Polynesia are really interesting. Not only was the word tatu (meaning "bringing the gods") originally Marquesan, that's where the whole tattooing process began. And not with sterile needles and processed ink. They used a shark-tooth comb, and ink made from soot from burning nuts and water. Literally, they dipped the comb into the ink and hammered it into the tattooee's skin. Adolescents started tattoos at puberty, and it continued for years, until almost all of the person's body was covered in intricate designs. Ouch! (Sue) Wow! 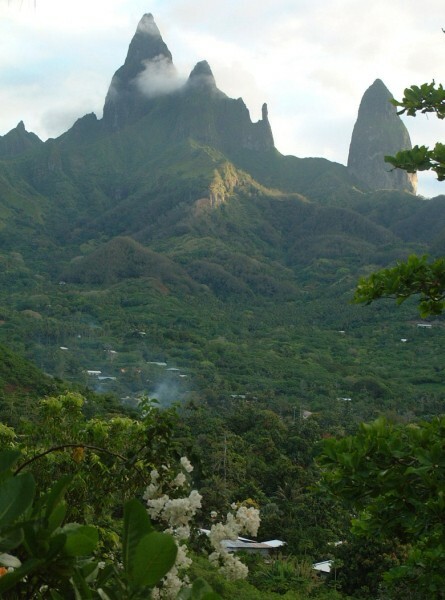 What a fabulous introduction to French Polynesia! I had fun pulling out my French again after 6 months in Latin America, and was happy to find that I didn't confuse myself too often! The clearing-in procedure was pleasant and simple with two French gendarmes who've been stationed on Ua Pou for years. The whole island is a garden of of tropical flowers and fruits like breadfruit, bananas, HUGE grapefruit (pamplemousse), avocados and mangos. The little shops along the three streets of the main town sold staples like flour, baguettes, canned butter, canned milk, oats, and other canned goods. No fresh anything. When I asked a shop keeper about the few mangos in a box by the cash register, she said, "Come back tomorrow. I'll have some for you." The next day she had 4 luscious mangoes, and would take no money for them. Our introduction to Marquesan culture at the local museum turned into a wonderful lecture (in English) by the island's one-man tourist promoter. We learned all about Marquesan tattoos, then were enticed into a 6-hour hike a few days later. 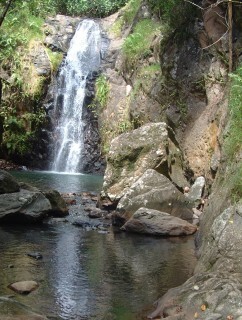 We climbed high on the pass under the towering spires, and down through jungle to a waterfall for a swim. The guides brought dried bananas wrapped in brown banana leaves, coconut water, fresh pamplemousse and mangos to fortify us. Back in town, we approached some home-owners about buying fruits and were loaded down with a stalk of bananas, and backpacks filled with fruit, all for free!